Page of "Keri Keri Keri". Over the years I have probably been witness to every conceivable way of executing strikes with the foot, as in kicks. Some methods of kicking are very good, but some other methods are not so. Upon reflection there is certainly much variety of thought and differing views on how to practise kicks, which is all fine of course. As I say some methods are and would be very effective and destructive in times of need, whilst others would be nothing less than useless. Well I’m not convinced anyway! For a Karate Ka to achieve a deeper understanding of their Art and this area of talk as in kicks, they will have to do this by going through their very own experiences and discoveries, including guidance, visualisation and much regular practise, together with frustration and at times failure. Then hopefully firm belief in their techniques too through an open minded approach to realistic effective training that has an in Dojo feel for things real. Some areas of one’s Karate understanding can be likened to being in the dark for many years, where by things don’t always just click or come together straight away; some things may take years to actually come together despite regular practise. Much of this though is down to the individual and the lessons that they go on to learn, thus combined with the type of Karate guidance that has been received along the way, there is also at times going to be individuality. Tamaki Sensei for example has a devastating Maegeri/Front Kick that is delivered in a kind of combined thrusting & snapping type action, whilst Slater Williams Sensei has a Maegeri that is driven from the floor through the calf to thigh at incredible speed with a deadly unstoppable force to match. So two differing variations of the same kick that are equally matched in effectiveness. Historical documented research on the Karate of Okinawa, including both the oral traditions and lessons from Okinawan Karate Sensei, all tend to state and indicate that teachers only practise/d a select few number of kicks, I’d have to say around six or so give or take one or two, thus preferring to work on a smaller number of kicks but working on these to the point that their effectiveness and ability to apply them was and is without question. In addition to this the preferred target areas for delivering kicks in most cases was to the more easily assessable middle or lower areas of the opponents body, proof again is to be easily found within the letters left from teachers of old as in our Karate Kata’s. 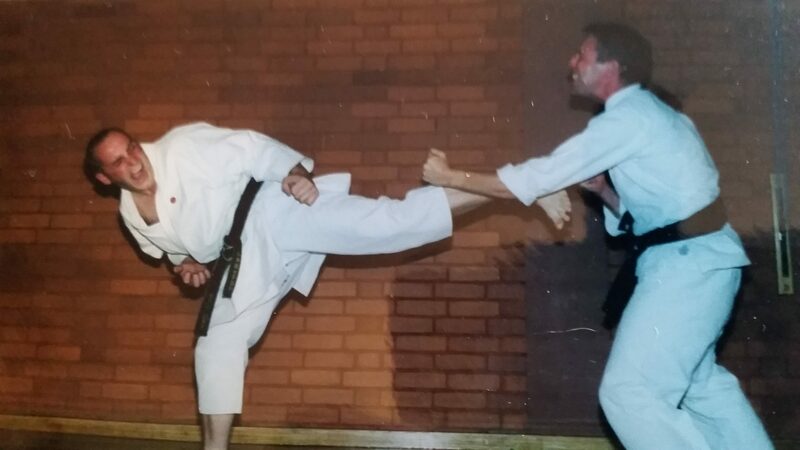 This though does not mean that high kicking and plenty of stretching was not practiced, on the contrary, as with much practise higher level kicks can certainly be used to effect in Karate, especially in one’s younger and middle age years. But in true Karate it all comes down to efficiency and effectiveness, where by for the average exponent a low or mid level kick executed with devastating effect is going to be a lot more applicable, realistic and higher up the scale as far as success goes than a high level head kick. The front kick in Goju Ryu Karate is performed a little bit higher than horizontal to the ground and it is aimed straight to the centre of the body. It is performed by hitting with the ball of the foot and the heel simultaneously. The ball of the foot hits the belly button area while the heel hits the groin area. This is how it was originally developed but then modified by modern day practitioners. (Takashi Miyagi Sensei, son of the founder of Goju Ryu Karate). Various Styles and Sensei do of course have varying preferences on how they wish for kicks to be executed within their training place or Dojo. But what I’m saying and listing here is a guide on the subject of Karate kicking which has nothing at all to do with Ryu/Style or preferences, these methods and thoughts should be universal and in the thoughts of all true Karate Ka, those who wish for their kicks to be effective in times of need. Karate is not about the differing ways of the Sensei, the School, the Style, or one Self. What is of paramount importance is that all have a very deep understanding of and total belief in the methods that they so diligently practise and teach. At times a lack of effectiveness and understanding is put down to the Art of Karate or a particular Ryu/Style/System. When in truth the fault usually lies with the lack of understanding of the Art by individuals. My teacher as in Senaha Sensei does in fact have a great little drill for working on the legs and practising kicks. I may actually put a few listed explanation photos together or maybe some you tube footage put up on here occasionally, but we’ll see…. As an example. Sensei also teaches the Keri Keri Keri set of his teacher Meitoku Yagi Sensei. Sensei often talks of Yagi Sensei as being an innovator who was always working on putting together new drills and training practises to help improve his own Karate together with that of his students. One such drill is the Keri Keri Keri, or kicking practise drill, which can be done as a solo Fu Kyu form or set, or in Renzoku with one training partner, or in Kakome being surrounded by up to 6 training partners. At the end of the day it’s not just about knowing how to perform or execute kicks, the Karate Ka needs to experience a variety and varying ways to practise them to effect with the correct flow, timing, distancing and accompanying foot work. I am often agitated when teaching Karate, or shall I say what aggravates me more than any other area, is why some people do some of the things that they do whist practising Karate. It is all a case of. Just why are you doing that? Surely you know that it would just never work, why just throw out techniques for the sake of it with little thought. 1 technique performed or execute correctly with feel is better than 100 techniques done or just thrown out for the sake of it. You see this so often these days with Kata, practising lots of Kata won’t make one a better Karate Ka if the feel and understanding is not there. there are so many that practise things that just don’t make sense from a true Karate perspective. Remember and be warned! There are some methods of practicing kicks that are likely to be more detrimental to your own health than any possible opponent, especially in the long term, we will all get body wear and tear with age it’s inevitable, but we should all really avoid prematurely putting ourselves on the local hospital hip or knee replacement waiting list. This must be noted and given serious consideration so please be aware. Here are a few areas that I have just briefly listed that I believe we should all take in to serious consideration when practising Keri/Kicks or Foot and Leg Strikes. Effectiveness; A kick must have a total no question effective destruction about it, head flicks and nice looking showy kicks have no part in true Karate. Naturalness; The body mechanics and natural body motions of the kick must be fully understood so that the transmission of your body’s power can delivered in to your opponent in a natural flowing way, thus having a maximum desired effect. Self Health & Injuries; Be sure that the kicks repetitive action in motion is not going to be detrimental to your own health, motions that put repetitive strain on joints or are totally unnatural to the way the human body moves are best avoided. The two main areas for concern are your knee and hip joints. Range; An understanding of the effective range of each kick in application is essential. At times you may be to close to the opponent, at other times to far away. This is where footwork and many hours of partner training is required. Desired Target Areas; Kicks need to be delivered towards the most easily accessable and most disabling vulnerable targets on the opponent’s body, like the knee, groin and ribs etc. The targets should already be there pointing at you, you shouldn’t need to be going looking for them. Foot Strike Positions; The strongest position for the striking area of the foot is to be fully understood and practised, or self injury upon impact may be inevitable, as in breaking your toes or any of the small bones in the foot. Rooting & Balance; The rooting of one’s own body during the execution of kicks needs to be practised to the point of perfection to maintain stability in the strike whilst balancing on the supporting leg. Yes it may only be for a fraction of a second but it is still essential, the same with maintaining a centred balance. Body Positioning; The appropriate use of the correct kick to deliver depending on the body positioning of yourself in comparison to the body positioning of your opponent. An opportunity always presents itself yes, but not for every kick or technique as this can be dependent on the opponent. Speed; Kicks need to be analyzed at varying speeds just like all other Karate techniques, so they need to be broken down and practised both slowly and of course quickly. All experts in all fields work at slow speed as they perfect form and the correction action. Thrust/ Snapping or Both; The force action through which the delivery of the kick is executed needs to be known, at times it may be a firm snapping action, at others a solid pushing thrusting action. Or maybe even a combination of the two. An understanding of the correct feel and muscle tension is also essential here to prevent injuries to the knee or hip joint. A quick flick is not a true snapping action, far from it. Kamae and Body Covering; The defensive protective positioning of the hands in relationship to the body, both prior to, whilst executing the kick and there after. Koshi or Hips; The natural positioning, rotation, loading, thrusting, or pushing forwards of the hip during the action of kick. Calf to Thigh or Thigh to Thigh: There is either/and calf to thigh, thigh to thigh rolling and knee lifting motions that need consideration, there are of course Sensei and school preferences again here, but it’s knowing how and why one is doing something that is of most importance. Timing; The timing of the delivery of the kick in relationship to the opening that is presented by the opponent or training partner. At times the opening is only there for the blink of an eye so the opportunity needs to be understood and taken. Foot Work; The use of foot work as in Ashi Sabaki, Tai Sabaki or Tenshin both prior to unleashing the kick and instantly thereafter is essential. Thus moving in, out, sidewards backwards and at angles, all must be worked. Supporting Foot Rotation & Fixation; An understanding of the correct use of the supporting foot is essential to achieve naturalness together with loading the hip in motion together with being a key factor in flow positioning to be able to generate maximum power. Knee injuries are common through misuse in this area.